Located on Lookout Mountain, at the entrance to historic Point Park, The Battles for Chattanooga is the perfect starting point for your tour of the area's Civil War battle sites. The perfect starting point for your tour of the area's Civil War battle sites. 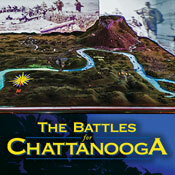 Hear and see about Chattanooga's Battles Above the Clouds and Sherman's assault on Missionary Ridge. This ticket is valid for admission every day except Christmas Day. 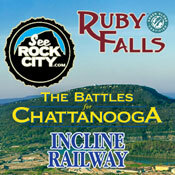 This combination ticket includes one general admission to each attraction: Rock City, Ruby Falls, Incline Railway, and Battles for Chattanooga. 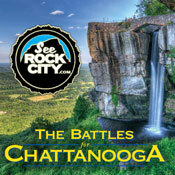 Ticket savings of $7.00 per adult and $4.00 per child off retail. Tickets expire one year from date of purchase. Includes general admission tickets - an upcharge will apply if visiting on a non-general admission priced day.